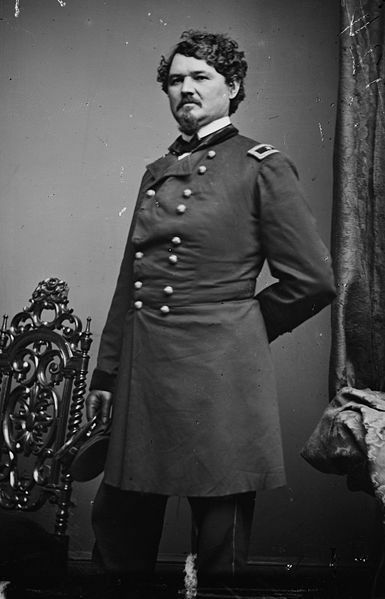 Samuel D. Sturgis received a report on the night of December 28, 1863, that a brigade of enemy cavalry was in the neighborhood of Dandridge that afternoon. Surmising that the Rebel cavalry force was split, Sturgis decided to meet and defeat, and possibly capture, this portion of it. He ordered most of his troopers out toward Dandridge on two roads. After these troops had left, Maj. Gen. William T. Martin, commander of Longstreet’s Confederate cavalry, now reunited, attacked the remainder of Sturgis’s force at Mossy Creek, Tennessee, which included the First Brigade, Second Division, XXIII Army Corps, commanded by Col. Samuel R. Mott, at 9:00 am. First, Sturgis sent messages to his subordinates on the way to Dandridge to return promptly if they found no enemy there. The Confederates advanced, driving the Federals in front of them. Some of the Union troopers who had set out for Dandridge returned. Around 3:00 pm, fortunes changed as the Federals began driving the Confederates. By dark, the Rebels were back to the location from which they had begun the battle. Union pursuit was not mounted that night, but Martin retreated from the area. After the victory at Mossy Creek, the Union held the line about Talbott’s Station for some time. The Battle of Mossy Creek was a minor battle of the American Civil War, occurring on December 29, 1863, in Jefferson County, Tennessee. Union Brig. Gen. Samuel D. Sturgis, while encamped at Mossy Creek and forward towards Talbott's Station, received a report on the night of December 28, 1863, that a brigade of Confederate cavalry had gone into camp that afternoon near Dandridge south of Mossy Creek. Surmising that the enemy force was split, Sturgis decided to meet, defeat, and possibly capture the encamped enemy cavalry. To accomplish this, he ordered a portion of his troops out of Mossy Creek and Talbott's Station toward Dandridge. After these forces had departed, Maj. Gen. William T. Martin, commander of Lt. Gen. James Longstreet's Confederate cavalry, encamped at Panther Creek near Morristown, attacked the small Federal force at Talbott's Station at 9:00 a.m. on December 29.